The main job role of an Administrative Analyst is to reduce the overall costs and improve the production levels simultaneously. 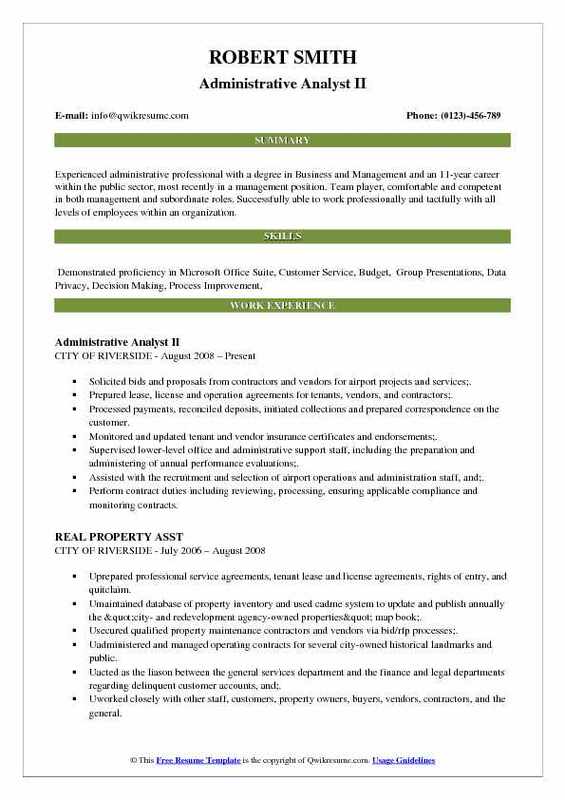 The resume of an Administrative Analyst is reviewed for strategic planning, finance expertise, analytical thinking, analyzing skills, flexibility, and attention to details. One must have either a Bachelor’s or Master’s degree in Finance, Business, Statistics, Accounting, Mathematics or Economics. An Administrative Analyst drags the data from Account Analyst and suggests budgets that would ensure maximum profits. They ensure proper utilization of resources by applying their analyzing skills. 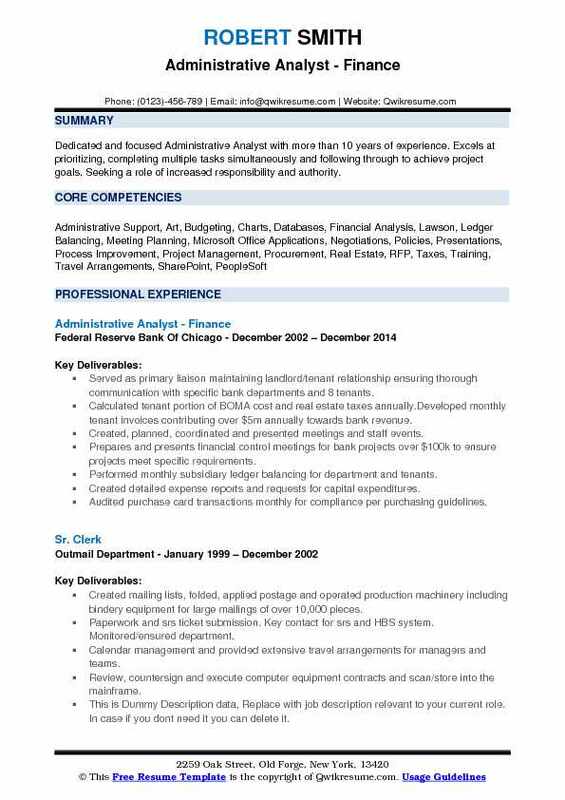 As an Administrative Analyst, you are expected to pro-actively perform to everyday challenges. The job role can give stability to your career with progressive growth in your seniority and income levels. 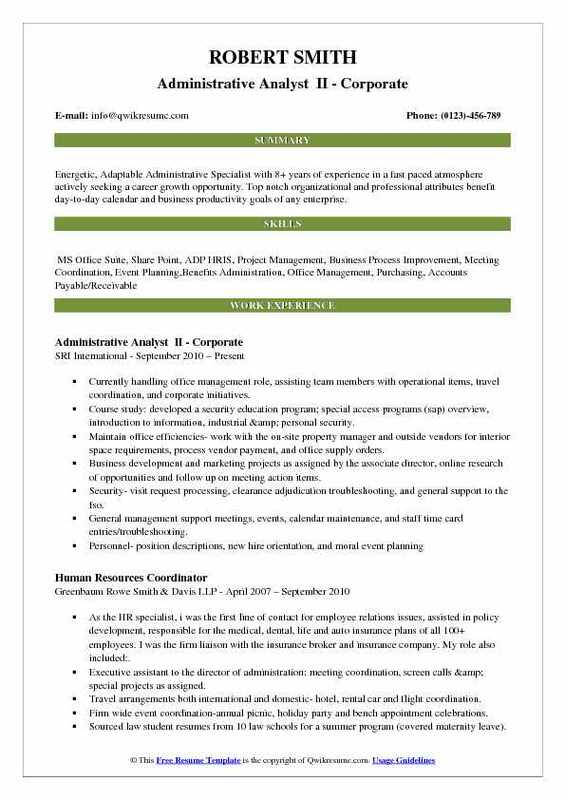 To get through in the interview, it is important that your profile should append with the key skills as given in Administrative Analyst Resume. 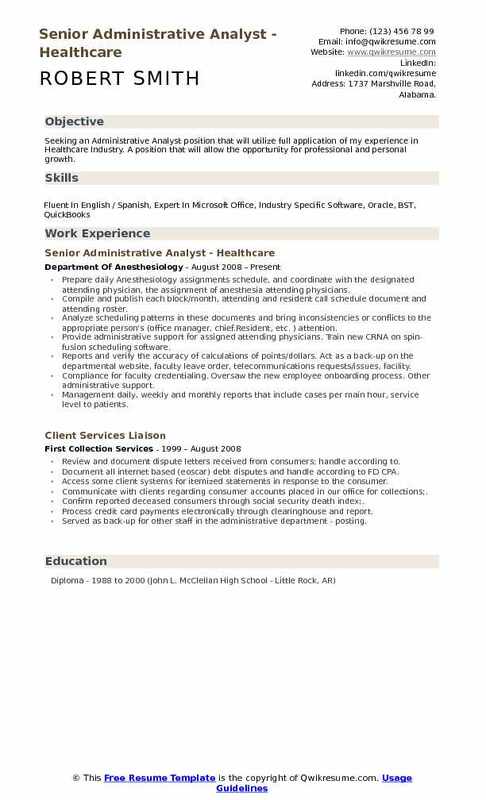 Summary : Seeking an Administrative Analyst position that will utilize full application of my experience in Healthcare Industry. A position that will allow the opportunity for professional and personal growth. Prepare daily Anesthesiology assignments schedule, and coordinate with the designated attending physician, the assignment of anesthesia attending physicians. Compile and publish each block/month, attending and resident call schedule document and attending roster. Analyze scheduling patterns in these documents and bring inconsistencies or conflicts to the appropriate person's (office manager, chief.Resident, etc. ) attention. Provide administrative support for assigned attending physicians. Train new CRNA on spin-fusion scheduling software. Reports and verify the accuracy of calculations of points/dollars. Act as a back-up on the departmental website, faculty leave order, telecommunications requests/issues, facility. Compliance for faculty credentialing. Oversaw the new employee onboarding process. Other administrative support. Management daily, weekly and monthly reports that include cases per main hour, service level to patients. 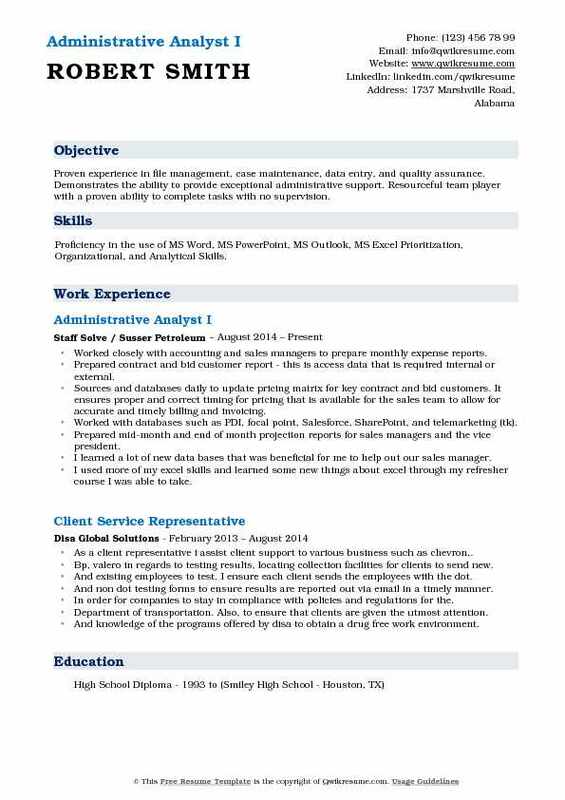 Summary : Dedicated and focused Administrative Analyst with more than 10 years of experience. Excels at prioritizing, completing multiple tasks simultaneously and following through to achieve project goals. Seeking a role of increased responsibility and authority. Served as primary liaison maintaining landlord/tenant relationship ensuring thorough communication with specific bank departments and 8 tenants. Calculated tenant portion of BOMA cost and real estate taxes annually.Developed monthly tenant invoices contributing over $5m annually towards bank revenue. Created, planned, coordinated and presented meetings and staff events. Prepares and presents financial control meetings for bank projects over $100k to ensure projects meet specific requirements. Performed monthly subsidiary ledger balancing for department and tenants. Audited purchase card transactions monthly for compliance per purchasing guidelines. Maintain, update, and analyze spreadsheets and databases to assess project costs, capital/expense art budgets. Summary : Energetic, Adaptable Administrative Specialist with 8+ years of experience in a fast paced atmosphere actively seeking a career growth opportunity. Top notch organizational and professional attributes benefit day-to-day calendar and business productivity goals of any enterprise. Currently handling office management role, assisting team members with operational items, travel coordination, and corporate initiatives. Course study: developed a security education program; special access programs (sap) overview, introduction to information, industrial & personal security. Maintain office efficiencies- work with the on-site property manager and outside vendors for interior space requirements, process vendor payment, and office supply orders. Business development and marketing projects as assigned by the associate director, online research of opportunities and follow up on meeting action items. Security- visit request processing, clearance adjudication troubleshooting, and general support to the fso. General management support meetings, events, calendar maintenance, and staff time card entries/troubleshooting. 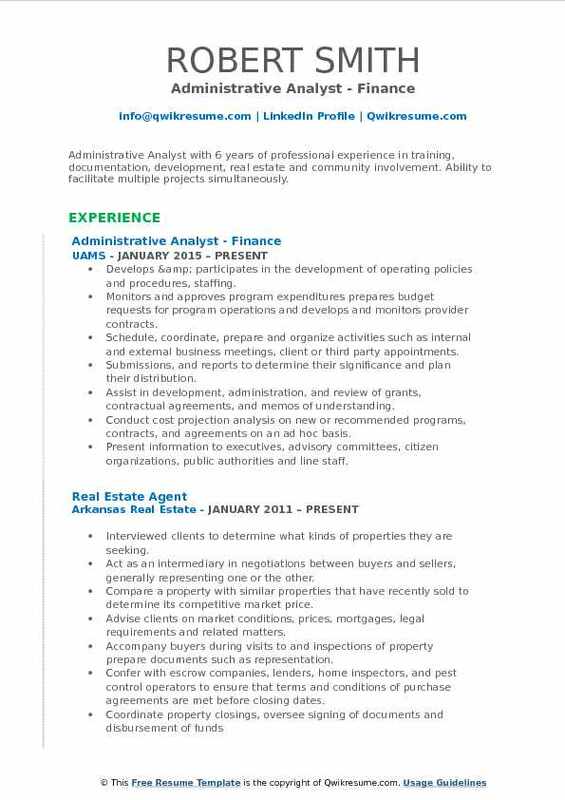 Headline : Administrative Analyst with 6 years of professional experience in training, documentation, development, real estate and community involvement. Ability to facilitate multiple projects simultaneously. Develops & participates in the development of operating policies and procedures, staffing. Monitors and approves program expenditures prepares budget requests for program operations and develops and monitors provider contracts. Schedule, coordinate, prepare and organize activities such as internal and external business meetings, client or third party appointments. Submissions, and reports to determine their significance and plan their distribution. Assist in development, administration, and review of grants, contractual agreements, and memos of understanding. Conduct cost projection analysis on new or recommended programs, contracts, and agreements on an ad hoc basis. Present information to executives, advisory committees, citizen organizations, public authorities and line staff. 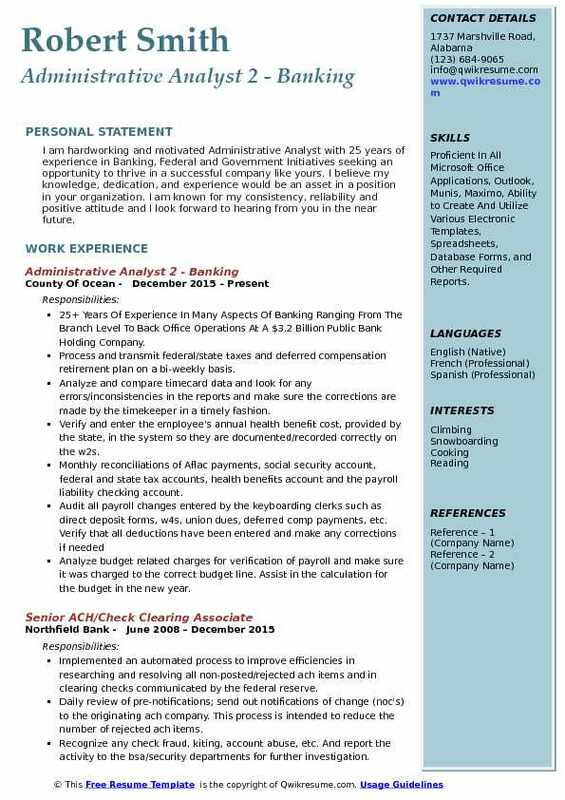 Summary : I am hardworking and motivated Administrative Analyst with 25 years of experience in Banking, Federal and Government Initiatives seeking an opportunity to thrive in a successful company like yours. I believe my knowledge, dedication, and experience would be an asset in a position in your organization. I am known for my consistency, reliability and positive attitude and I look forward to hearing from you in the near future. 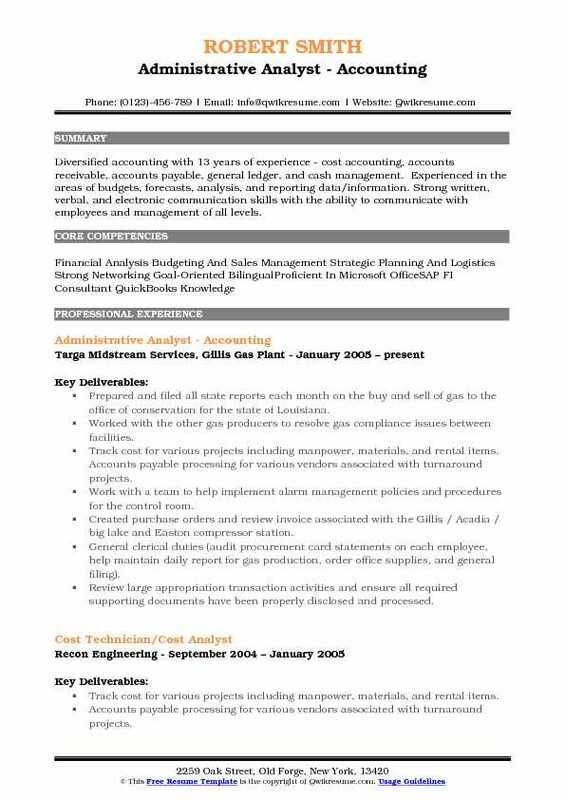 Skills : Proficient In All Microsoft Office Applications, Outlook, Munis, Maximo, Ability to Create And Utilize Various Electronic Templates, Spreadsheets, Database Forms, and Other Required Reports. 25+ Years Of Experience In Many Aspects Of Banking Ranging From The Branch Level To Back Office Operations At A $3.2 Billion Public Bank Holding Company. Process and transmit federal/state taxes and deferred compensation retirement plan on a bi-weekly basis. Analyze and compare timecard data and look for any errors/inconsistencies in the reports and make sure the corrections are made by the timekeeper in a timely fashion. Verify and enter the employee's annual health benefit cost, provided by the state, in the system so they are documented/recorded correctly on the w2s. Monthly reconciliations of Aflac payments, social security account, federal and state tax accounts, health benefits account and the payroll liability checking account. Analyze budget related charges for verification of payroll and make sure it was charged to the correct budget line. Assist in the calculation for the budget in the new year. 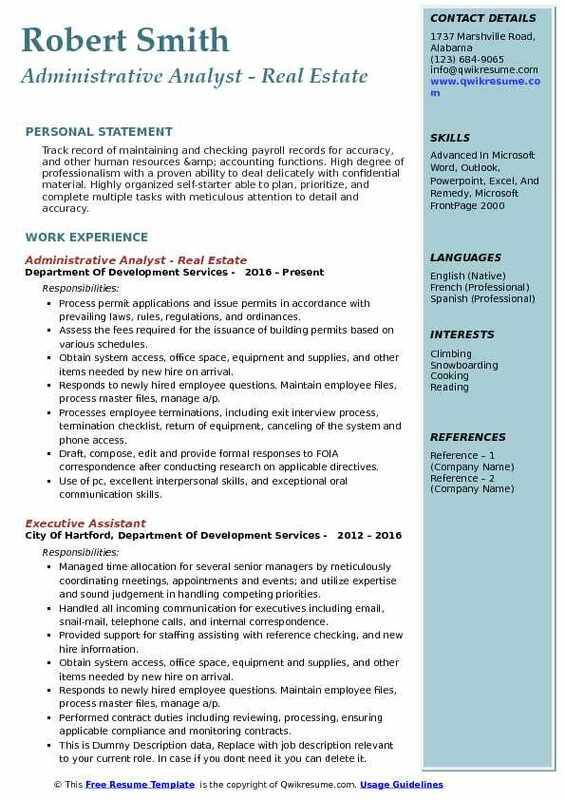 Summary : I am highly focused and career oriented professional with over 11 years experience providing services to students in higher education, seeking a role in the area of Advocacy and Support for Family and Social Services. Served as the only official officer for veterans affairs, managing the enrollment and certification of classes and provided one on one counseling and support for over 300 veterans. Supervised 9 record's specialists within records unit. Serve as a lead official officer for veterans affairs, managing over 150 veteran's enrollment and certifications. Providing one on one advisement and advocacy on various matters, on a daily basis. Provide oversight to determine the status of and provide advocacy and support to various populations, such as disqualified students and those requesting residency reclassification, for over 50 students per quarter. Provide support and oversight for more than 200 participants in specialized programs including i-poly high school young scholars, national student exchange (NSE), CalWORKs, international students, and CSU/UCI ed (doctoral program). Plan and develop written documentation on policies and procedures and serve as an advocate providing guidance and support in all campus related services. Resolve student, staff and faculty problems based on knowledge of policies and procedures. Generate quarterly reports on academic standing, grade posting, etc. importing data to excel spreadsheets for further analysis. 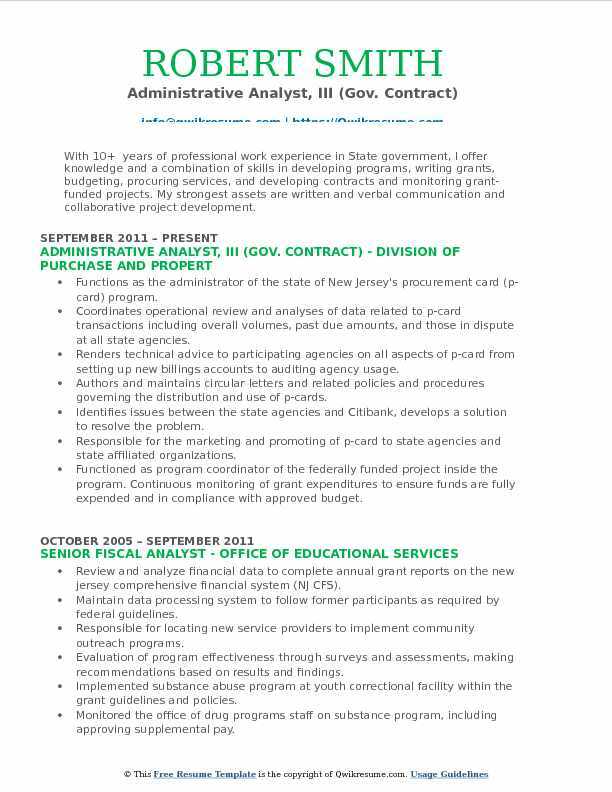 Summary : With 10+ years of professional work experience in State government, I offer knowledge and a combination of skills in developing programs, writing grants, budgeting, procuring services, and developing contracts and monitoring grant-funded projects. My strongest assets are written and verbal communication and collaborative project development. Functions as the administrator of the state of New Jersey's procurement card (p-card) program. Coordinates operational review and analyses of data related to p-card transactions including overall volumes, past due amounts, and those in dispute at all state agencies. Renders technical advice to participating agencies on all aspects of p-card from setting up new billings accounts to auditing agency usage. Authors and maintains circular letters and related policies and procedures governing the distribution and use of p-cards. Identifies issues between the state agencies and Citibank, develops a solution to resolve the problem. Responsible for the marketing and promoting of p-card to state agencies and state affiliated organizations. Functioned as program coordinator of the federally funded project inside the program. Continuous monitoring of grant expenditures to ensure funds are fully expended and in compliance with approved budget. Summary : Diversified accounting with 13 years of experience - cost accounting, accounts receivable, accounts payable, general ledger, and cash management. Experienced in the areas of budgets, forecasts, analysis, and reporting data/information. Strong written, verbal, and electronic communication skills with the ability to communicate with employees and management of all levels. Prepared and filed all state reports each month on the buy and sell of gas to the office of conservation for the state of Louisiana. Worked with the other gas producers to resolve gas compliance issues between facilities. Track cost for various projects including manpower, materials, and rental items. Accounts payable processing for various vendors associated with turnaround projects. Work with a team to help implement alarm management policies and procedures for the control room. Created purchase orders and review invoice associated with the Gillis / Acadia / big lake and Easton compressor station. General clerical duties (audit procurement card statements on each employee, help maintain daily report for gas production, order office supplies, and general filing). Review large appropriation transaction activities and ensure all required supporting documents have been properly disclosed and processed. 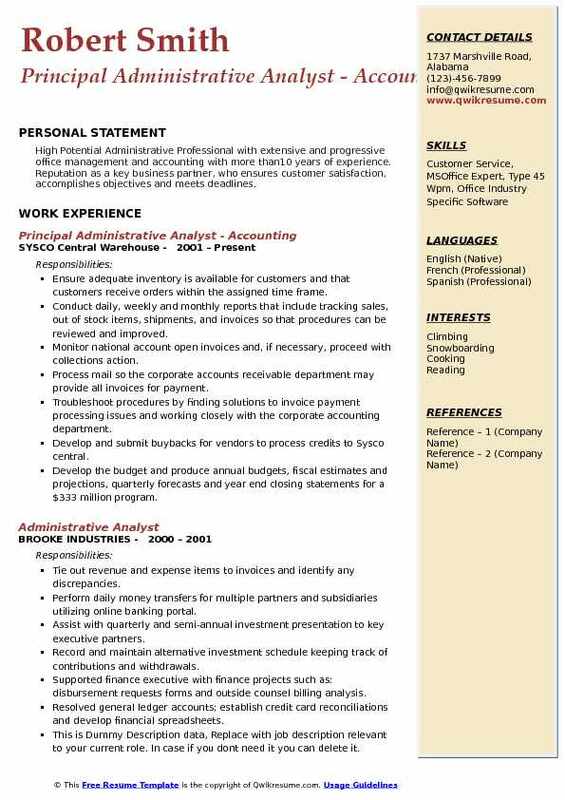 Summary : High Potential Administrative Professional with extensive and progressive office management and accounting with more than10 years of experience. Reputation as a key business partner, who ensures customer satisfaction, accomplishes objectives and meets deadlines. Ensure adequate inventory is available for customers and that customers receive orders within the assigned time frame. Conduct daily, weekly and monthly reports that include tracking sales, out of stock items, shipments, and invoices so that procedures can be reviewed and improved. Monitor national account open invoices and, if necessary, proceed with collections action. Process mail so the corporate accounts receivable department may provide all invoices for payment. Troubleshoot procedures by finding solutions to invoice payment processing issues and working closely with the corporate accounting department. Develop and submit buybacks for vendors to process credits to Sysco central. Develop the budget and produce annual budgets, fiscal estimates and projections, quarterly forecasts and year end closing statements for a $333 million program. 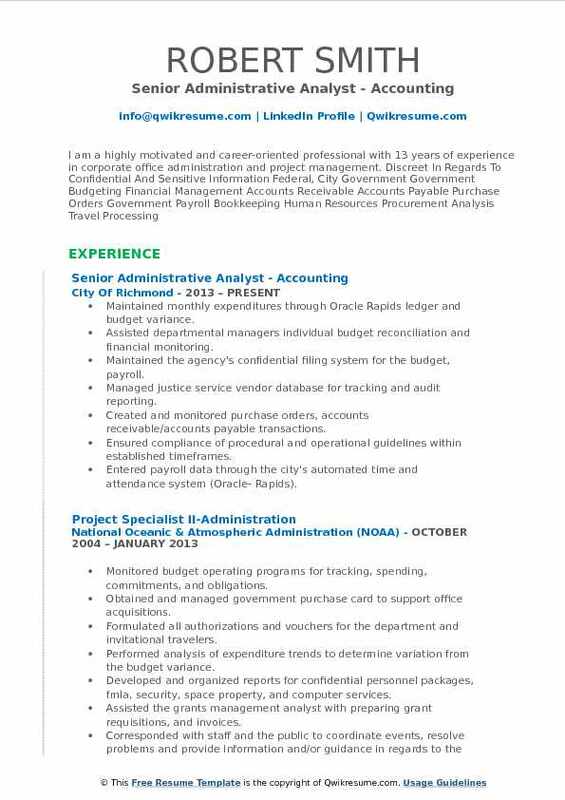 Summary : Highly organized Administrative Analyst with over 9 years of experience in Executive Support, Office Management, Facilities Management, and Purchasing. Motivated by professional development while utilizing current skills and knowledge to make a positive difference on the teams. Technology infrastructure, and implementation and training of software. Redesigned internal network which included the introduction of new ISP resulting in increased reliability and speed for users by almost 75%, as well as significant cost savings to the agency. Researched, purchased and supervised the installation of new network equipment that increased. Spearheaded transition to VoIP phone system, resulting in a more robust system for users as well as reducing cost by approximately 35%. Highly involved in development, roll-out, maintenance, and training of new online registration and governing board agenda software. Responsible for project management of agency facility remodel, which includes collaborating with the architect on timeline and completion of the project. Summary : Over 12 years experience in administrative and office management, leading operations in banking centers and direct client involvement. Provide executive-level administrative support to the senior vice president of government banking division. Liaison between all impacted departments to ensure proper communications and reporting practices. Manage capital purchases, direct vendor relations, generate and maintain equipment tracking records. Write and prepare a response to a request for proposals (RFP's) for government entities. Proofread, format, and edit team's proposals prior to client delivery. Prepare and manage staff meetings, team events, client activities, and conferences. Responsible for monthly general ledger (GL) certifications to ensure proper audit compliance. Constantly multitasking with clients and associates via in-person, phone, and email. Objective : Seeking a position in a challenging and dynamic office environment; which will maximize my skills, expertise and, wide-range experience and allow personal and professional growth, development and future opportunities. Ensure that all meetings have the necessary av connections including an accurate call in numbers, Adobe webinar links, vtc accompanying documentation, etc. Assist directors in developing and maintaining organizational systems (electronic and paper folders, daily/weekly materials, other necessary documents to ensure efficient operations. Attend all model core and group meetings, take notes and provides the team with action items and tracks deliverable to ensure accountability for tasks. Maintain sig calendars and contact information in coordination with group/ team leads and relevant support groups and contractors. Perform other duties to support efficient operation as directed by sig directors. Coordinates with human capital coordinator lead to ensure that new employees obtain necessary system access. 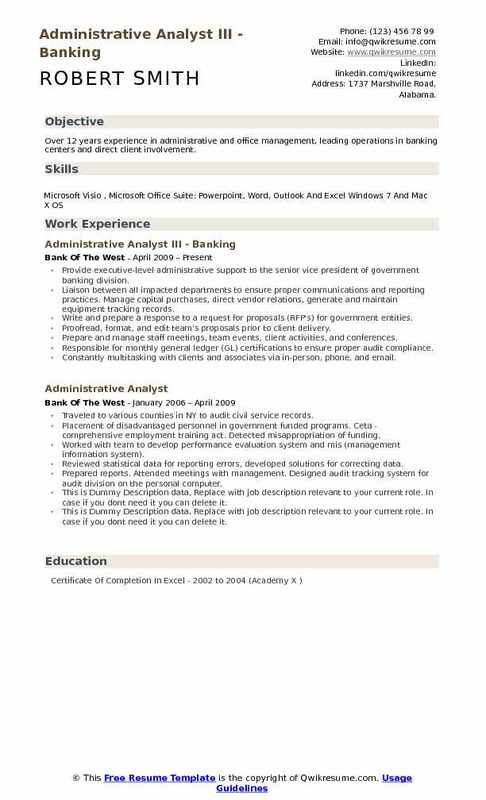 Summary : Experienced administrative professional with a degree in Business and Management and an 11-year career within the public sector, most recently in a management position. Team player, comfortable and competent in both management and subordinate roles. Successfully able to work professionally and tactfully with all levels of employees within an organization. Solicited bids and proposals from contractors and vendors for airport projects and services;. Prepared lease, license and operation agreements for tenants, vendors, and contractors;. Processed payments, reconciled deposits, initiated collections and prepared correspondence on the customer. Monitored and updated tenant and vendor insurance certificates and endorsements;. Supervised lower-level office and administrative support staff, including the preparation and administering of annual performance evaluations;. Assisted with the recruitment and selection of airport operations and administration staff, and;. Perform contract duties including reviewing, processing, ensuring applicable compliance and monitoring contracts. Maintained monthly expenditures through Oracle Rapids ledger and budget variance. 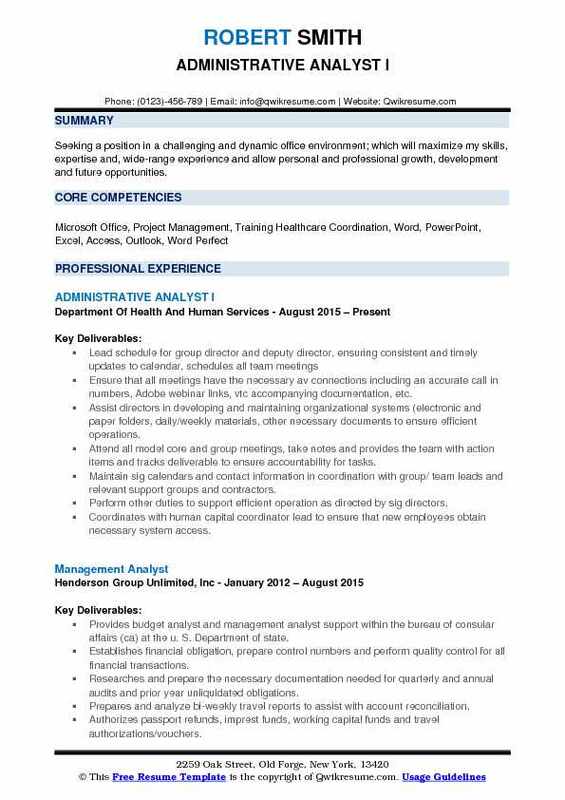 Assisted departmental managers individual budget reconciliation and financial monitoring. Maintained the agency's confidential filing system for the budget, payroll. Managed justice service vendor database for tracking and audit reporting. Created and monitored purchase orders, accounts receivable/accounts payable transactions. Ensured compliance of procedural and operational guidelines within established timeframes. Entered payroll data through the city's automated time and attendance system (Oracle- Rapids). Headline : Track record of maintaining and checking payroll records for accuracy, and other human resources & accounting functions. High degree of professionalism with a proven ability to deal delicately with confidential material. Highly organized self-starter able to plan, prioritize, and complete multiple tasks with meticulous attention to detail and accuracy. Process permit applications and issue permits in accordance with prevailing laws, rules, regulations, and ordinances. Assess the fees required for the issuance of building permits based on various schedules. Obtain system access, office space, equipment and supplies, and other items needed by new hire on arrival. Responds to newly hired employee questions. Maintain employee files, process master files, manage a/p. Processes employee terminations, including exit interview process, termination checklist, return of equipment, canceling of the system and phone access. Draft, compose, edit and provide formal responses to FOIA correspondence after conducting research on applicable directives. Use of pc, excellent interpersonal skills, and exceptional oral communication skills. Objective : Proven experience in file management, case maintenance, data entry, and quality assurance. 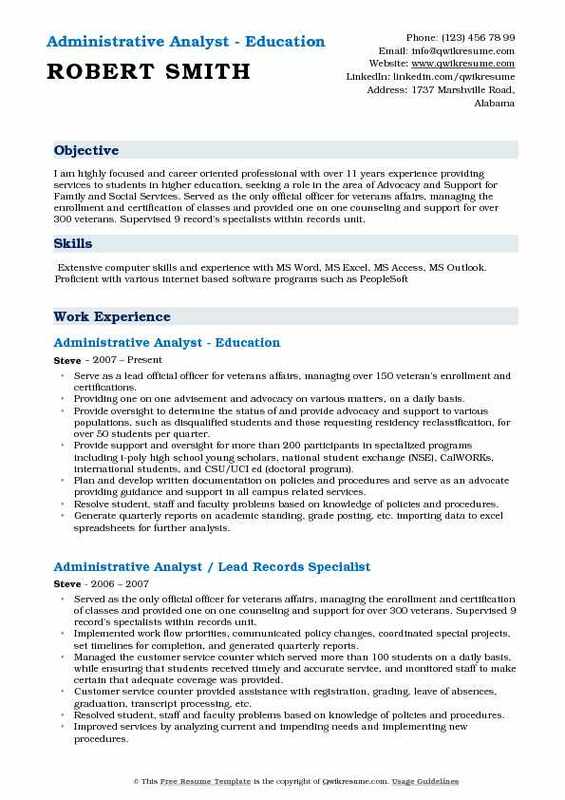 Demonstrates the ability to provide exceptional administrative support. Resourceful team player with a proven ability to complete tasks with no supervision. 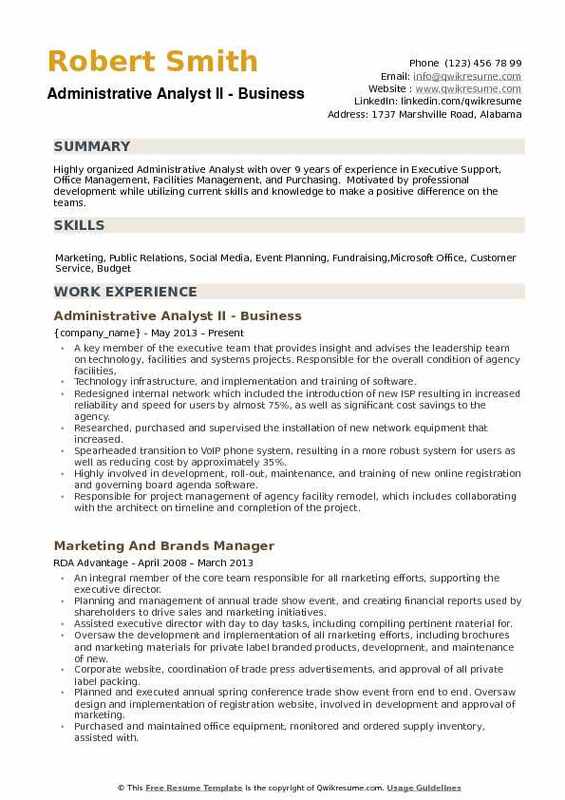 Skills : Proficiency in the use of MS Word, MS PowerPoint, MS Outlook, MS Excel Prioritization, Organizational, and Analytical Skills. Worked closely with accounting and sales managers to prepare monthly expense reports. Prepared contract and bid customer report - this is access data that is required internal or external. Sources and databases daily to update pricing matrix for key contract and bid customers. It ensures proper and correct timing for pricing that is available for the sales team to allow for accurate and timely billing and invoicing. Worked with databases such as PDI, focal point, Salesforce, SharePoint, and telemarketing (tk). Prepared mid-month and end of month projection reports for sales managers and the vice president. I learned a lot of new data bases that was beneficial for me to help out our sales manager. I used more of my excel skills and learned some new things about excel through my refresher course I was able to take.